The Big Takeaway: Roman Reigns defeated Sheamus to retain the WWE World Heavyweight Championship in a match where Vince McMahon was special referee. Of course, it wasn't Vince who counted the pinfall. Afterwards, Vince announced that Reigns would defend the WWE World Heavyweight Championship in the Royal Rumble match itself. It's the first time since 1992 that the championship will be on the line in the Royal Rumble match. Chris Jericho returned in a disappointing segment with New Day. Brock Lesnar returns next week. Stephanie McMahon started to come out but Roman Reigns' music played as she was making her entrance. So they were in the ring together. Reigns said they didn't need her out there, it was about Vince McMahon, who he called out. Stephanie said Vince wasn't in the building yet, and the odds weren't in his favor tonight. Reigns said the WWE World Heavyweight Championship was his life because it's how he supports his family. Stephanie said no one competes with Vince McMahon and wins in the end. She mentioned the charges against Vince from last week have been dropped because you can't keep a good billionaire down. Well, multi-millionaire. Stephanie said once Reigns loses the championship tonight, she'll use him over and over until his body wears out. Reigns said if Vince screws him over tonight, Stephanie won't be picking him up from jail, she'll be picking him up from the hospital. Dean Ambrose came out to do commentary for the match with Kevin Owens and Neville. Reigns waited through a video package to slap hands with him, which may be foreboding the Ambrose turn we've waited months for. Brock Lesnar is back next Monday in New Orleans. Another example of buidling things a week in advance. Next week is also the College Football Playoff National Championship game with Clemson vs. Alabama. Considering how disappointing the CFP semifinal ratings were, it'll be interesting to see how much of a hit Raw will take. Solid match. Kevin Owens won after he crotched Neville on the top rope. He finished Neville off with the Pop-Up Power Bomb. Neville did a 450 from the apron to the floor. Neville is still carrying around his Slammy for Newcomer of the Year. Strikes me as odd since that was usually a heel move in the past, namely with Owen Hart. JBL compared Neville to Too Cold Scorpio and Owens to Otto Wanz in the span of 30 seconds. Owens tried to attack Neville afterwards, but Ambrose stopped it with a tope. Well, it was a tope that he largely whiffed on. They fought to the announcers table, where Owens teased power bombing Ambrose through the table again. Instead, Ambrose turned the tables and gave Owens an elbow drop off the barricade through the table. Vince walked out of a limousine where Jojo stopped him. Vince said the charges against him were dropped because he has a good attorney. The irony of it all is last week he was arrested by the law, and this week he is the law. They showed a vignette to promote the Taratino movie The Hateful Eight counting down the eight superstars people love to hate. Number three was Owens. Number 2 was the New Day (?). And tops was Sheamus. Only if Vince was doing the countdown, which may have been the case. Titus O'Neal won with the Clash of the Titus. Of all the matches I've seen, this was the most recent one. Charlotte approached Becky Lynch backstage. The two are wrestling tonight and Charlotte wasn't happy about it. She asked Lynch if she asked for the rematch. Lynch said she didn't, but she was excited about it. Charlotte said she had already beaten Lynch once on Raw. They agreed to meet again tonight in the spirit of competition. Ric Flair came up from behind Lynch and made her jump when he yelled "Whoo!" I don't want to ask why Flair would have been waiting behind Lynch for so long, but I can speculate. They teased the finish from November where Flair tried to trip Lynch, leading to Charlotte winning via schoolgirl cradle. Except this time, Lynch escaped the cradle and pinned Charlotte with a Oklahoma Side Roll while holding the trunks. To complete the heel turn, Charlotte attacked Lynch in the postmatch, giving Lynch a spear and laying the boots to her. Flair cheered her on. They wrestled scientifically until Charlotte leveled Lynch with a punch. Charlotte was a straight heel from that point forward. McMahon talked with Sheamus backstage to explain prefight instructions. No biting, no outside interference, no low blows and to obey his commands. McMahon added with a grin "may the luck of the Irish be with you." Ryback was tossed over the top rope by the Big Show when the Wyatt Family appeared. Braun Strowman put Ryback out with the choke. Then the Wyatts surrounded the ring on Show, who clotheslined Bray Wyatt, Luke Harper and Erick Rowan. Strowman had a staredown with Show that was supposed to generate heat, but didn't. The three heels jumped Show from behind and Harper left Show laying with a superkick. Looks like another babyface turn for Big Show, who has to hold the all-time record by now. Alberto Del Rio pinned Jimmy Uso with the top rope stomp. Very good match. Earlier, Del Rio had Jey Uso set up for the stomp, but somehow missed. Jimmy followed with a top rope splash that was broken up by Rusev in the first of several good near falls. Rusev gave Jey Uso a belly-to-belly superplex for the heat. Again, no Lana and no mention of her, except by the crowd. Heath Slater was joined by Curtis Axel, Bo Dallas and Adam Rose. Can someone explain where Damien Sandow is and why isn't he on my TV? Slater, who has a haircut, won after Rose and Axel distracted Dolph Ziggler, and Slater won with a rollup. Postmatch, Rose, Axel, Slater and Dallas cut promos invidually. They've now started a group called "Social Outcasts." Ziggler cut a inset promo about being in the Royal Rumble. For a better promo, search "Josh Norman" under Youtube. The sad part is Josh Norman is not a pro wrestler. He's a cornerback for the Carolina Panthers who cuts better promos than anyone in pro wrestling aside from Paul Heyman. That's exhilarating and depressing all at once. Steve Austin will have Flair on his podcast next week. Vince approached Reigns backstage. Vince, again playing the role of John McCarthy, had a rules meeting with him. Vince didn't wish him good luck as he left. The New Day, which has a new video that features them in animated form riding unicorns with rainbows in the background, came out. Big E. laughed over Mike Tyson falling down while riding a Hoverboard. Then they pointed to the TitonTron, where they started to have a countdown. But the countdown was interrupted by Chris Jericho's countdown, who came out to a good, but not great, pop. No one remembered Jericho going heel at Night of Champions on Ambrose and Reigns. He did various catchphrases before Xavier Woods stopped him saying they've already saved the WWE in 2015. Jericho said live attendance, ratings and WWE Network numbers need a boost. That was weird. He called them Green Day and tried to get fans to chant "Rooty Tooty Booty." That sounded cringeworthy but the fans chanted it as long as New Day was out there. Jericho announced that he would be in the Royal Rumble. 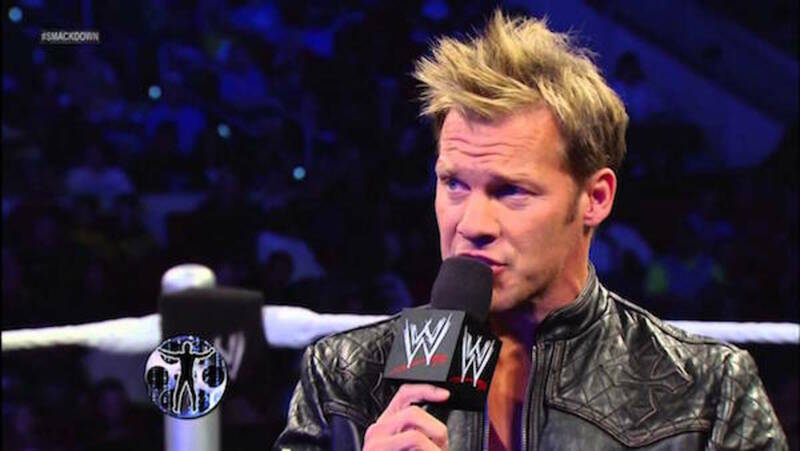 Of all the Jericho returns, this was easily the least remarkable and felt flat. Feels like New Day needs a new spark because they've hit a dry spell. Big E. pinned Devon Dudley after the Midnight Hour. Your weekly six-man match that went too long. Bubba Ray Dudley threw Kalisto onto all three members of New Day outside the ring. Kalisto was taken out by Big E. at ringside. The Dudleys tried to set up Wazzup on Kofi Kingston, but Woods broke it up by dumping Devon to the mat. Vince came out where the tightest referee t-shirt imaginable for any 70-year-old that has the physique that he has. Apparently, he's not counting on Al-Jazerra calling anytime soon. He did look a little skinnier. Somebody had a "Cranky Vince" sign that lasted about as long as one of Kim Kardashian's undershirts. That twitter account hasn't been updated in over two years. Vince played heel ref from the start, trying to fast count Reigns. Sheamus threw Reigns into the ring steps, then threw the steps at him. He later suplexed Reigns onto the announcer's table. Sheamus used a Rolling Senton for a two count. When Reigns covered Sheamus after a Samoan Drop, Vince counted slower than the Great Kabuki's ring entrance this morning. Then Reigns had the cover with a Backland lift, but Vince faked an eye injury. Reigns hit the Superman punch, but Vince didn't even count. He was still faster than Bronco Lubich. Reigns told Vince "Watch this." He teased giving Sheamus the Superman punch, but instead he punched Vince. Then Reigns speared Sheamus and pinned him, but no ref. An incensed Reigns threw Sheamus over the announcer's table as Vince recovered. Vince try to scramble away but Reigns threw him down and told him Vince was screwing with his life. Stephanie came out. Reigns threw Vince into the ropes, and Stephanie wound up rebounding into the ring. Reigns stalked over her but she got out of the ring. Reigns teased spearing Vince, Sheamus came back in the ring and hit Reigns with two Brogue kicks. For some reason, Vince didn't count Sheamus out. Instead, Scott Armstrong ran out. It was explained that Armstrong was a heel referee who had worked with the Authority for years. Who remembers that? He hasn't been on TV in years. Reigns kicked out. Armstrong then held Reigns up for Sheamus to Brogue Kick him again. But Reigns sidestepped him, hit Armstrong with a Superman's punch, flattened Sheamus with another Superman's punch. Referee John Coleman (they actually identified him on TV) ran down and counted the pin for Reigns. Vince knocked down Coleman. Vince's physique looks great. As for his punches, all I can say his physqiue looks great. Afterwards, he announced that Reigns would defend the title in the Royal Rumble match against 29 other men. SUMMARY: Since the horrendous show a month ago when I said that Reigns wasn't the guy, the WWE has booked him very well. He'll be the first man ever to defend the WWE Championship in a Royal Rumble. If he emerges with the belt, it'll make him all that much stronger. Not sure what other option makes sense. A pretty good show.